Each plan includes 15 strength training workouts for 30 workouts total! Only 3 days of running each week! Join us today and run, lift and stretch your way to fit! The Zero2Run training program will take you from zero to the finish line of a 5 or 10K race in just 8 weeks…while also helping you get strong and fit! Whether your goal is to run your first race or just to find a balanced routine that includes running and strength training, Zero2Run will get you there! Many running training plans lack the inclusion of strength training or don’t provide direction on what to do. Our plan features specific strength, circuit and interval training workouts written by experienced trainers Emily and Jen. The workouts are designed to complement the prescribed runs by helping you build strength and endurance. We also allow two days a week for rest, walking, stretching or yoga. These recovery days are an integral part of any training plan. The combination of running, strength and mobility helps you prevent injuries as you build strength and increase your overall fitness. 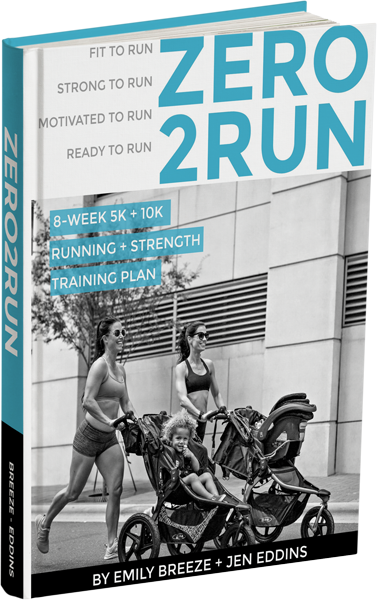 The Zero2Run plan includes 8-week training plans for both 5K and 10K race distances along with 15 strength training workouts to go with each plan. So you get TWO training plans and 30 workouts! This allows you to keep challenging yourself and building your fitness. Once you’ve tackled the 5K plan, you can move on to the 10K plan with longer runs and harder workouts! If you’re at zero looking for a place to start, Zero2Run is for you. If you’re needing a change of pace and a well-rounded fitness plan, Zero2Run is for you. If you’ve got your sights set on crossing the finish line of your first race, Zero2Run is for you. If your goal is to tackle your first 10K, Zero2Run is for you.